Home › News & Noteworthy › Exploring Natural Dyes with Michel Garcia and Yoshiko Wada in Brittany France! Image of DVD and Britanny, France countryside. In April of 2018 Yoshiko Wada of the World Shibori Network and Slow Fiber Studios and I traveled to Brittany, France to spend two weeks with Michel Garcia in his new studio and home workshop on the coast of France. It's always exciting to see what Michel is up to and how he uses local plants and ancient methods to create natural dye processes. Michel was living in a beautiful hillside fortress town called Lauris, which is in the heart of Provençe. Several of the natural dye workshop series films were filmed there, taking advantage of the many historical plants and minerals in the area which for centuries were used to produce natural dyes. Michel made the bold move to resettle along the coast of Southwest France in late 2017. A visit to the local museum helped him realize how strategically important this area -- once known as Normandy (and home to the 'Galli's', my family ancestors) -- was not only defensively to the kingdoms of France but as well for harvesting seaweed for a variety of products we use today (including thickener for dyes -- sodium algaenate). By baking and then crushing shells from the sea you had an ample and inexpensive substitute for Lime which could be used as a dye fixative on wool, silk, cotton and other fibers. 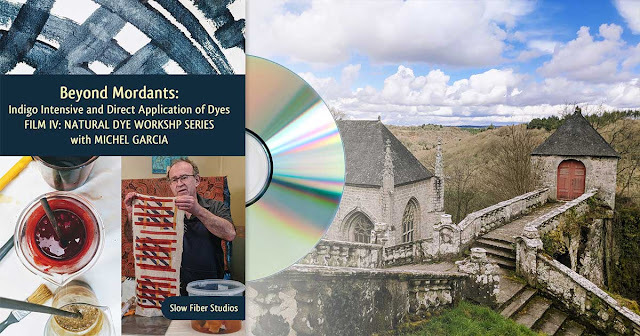 The DVD, "Beyond Mordants: Indigo Intensive and Direct Application of Dyes" is an exploration of in-depth indigo vat processes as well as how to use sodium alginate from sea weed as a thickener for the direct application of dyes on fabric without the use of mordants. The DVD is 2-discs as usual for the Natural Dye Workshop Series and with more than 5 hours of slated video education it sure to pack a lot of new tips and scoops into Michel's ever-expanding world of natural dyeing for fabric arts. Now available from Slow Fiber Studios, with subtitles in several languages.